My mom has this awesome Jewelry Pouch that she takes with her on every trip she goes on. It’s big enough to bring a few statement pieces and small enough that it fits in any tight space in her suitcase. 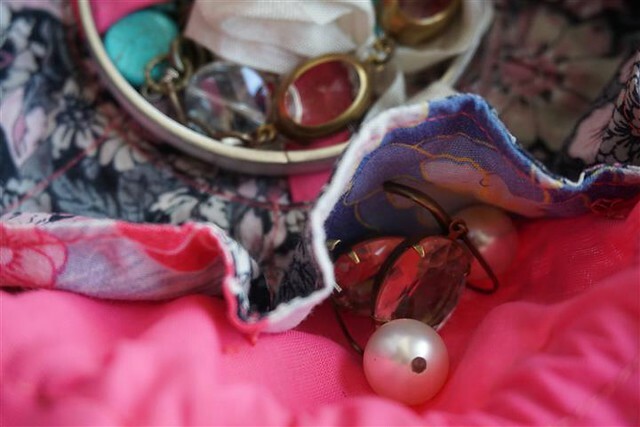 It also boasts some lovely space separators to keep smaller items, like rings and earrings, from getting lost and/or caught in bigger items like necklaces and bracelets. So I set about making two of my own; one to bring all my jewelry with me to the Netherlands and one to travel with on all my other trips! These instructions are for the smaller travel pouch. 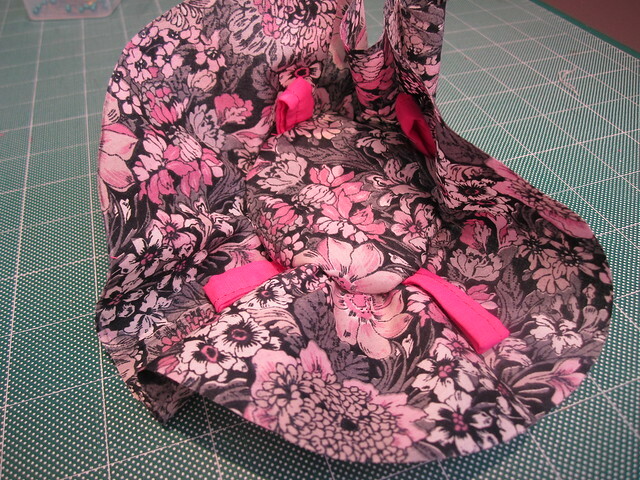 I spent some time putting different fabrics together before deciding on what I wanted. 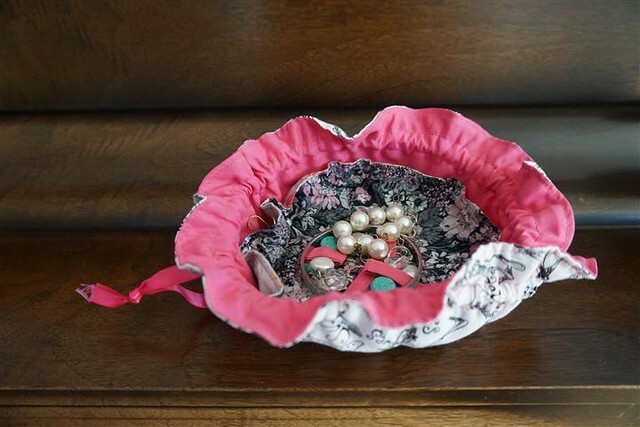 This was a great way to use up some scrap pieces of fabric I had. 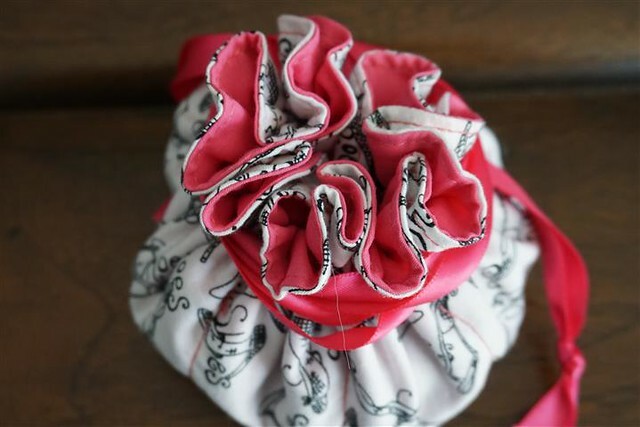 I used an old, ripped pair of pj’s, fabric from an old, ill-fitting dress, and leftovers from the drawstring bags I made several years ago. Press the the 1.5″ x 8″ piece in half lengthwise. Press each side in half again, so the rough edges are together in the centre. 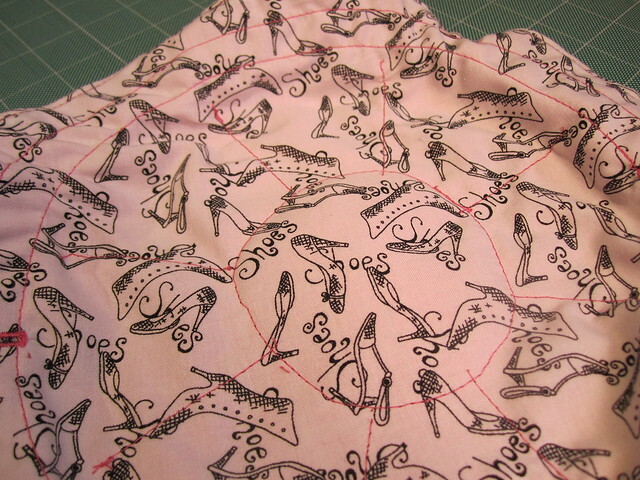 Press in half lengthwise again, and sew together. Alternatively, you could sew it together, lengthwise and turn right side out. I’m pretty crappy at turning small thing right side out, so I opted for the press method instead. 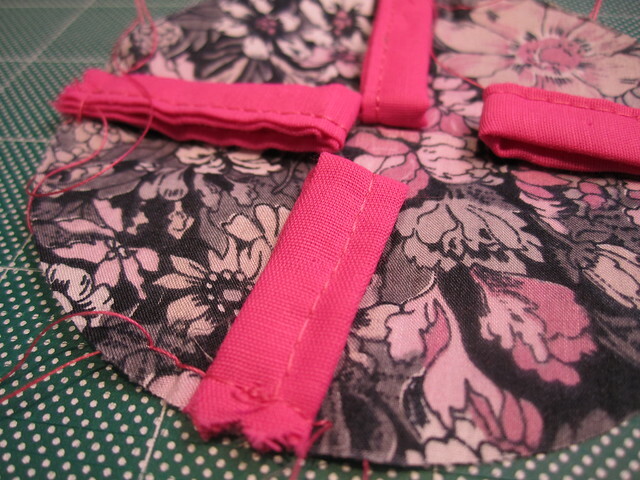 Cut into 2″ pieces which will form the tabs for the inside of the pouch, where I thread my necklaces through. Sew these tabs int the small circle, facing in. 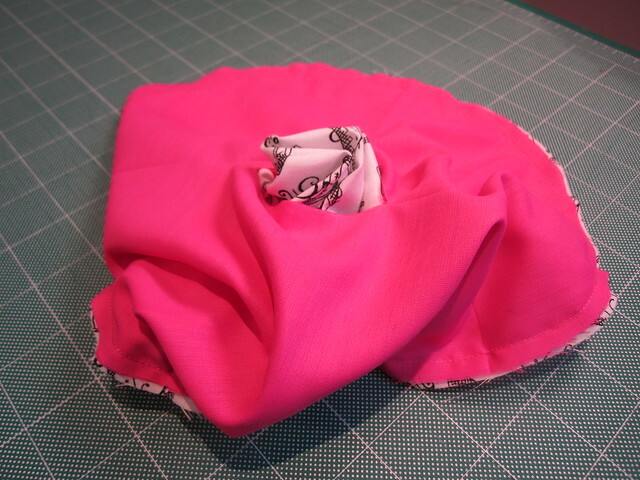 Sew the small circle into the doughnut shaped piece, making sure to keep the tabs loose. This was by far the hardest part! There’s a small wrinkle that I couldn’t get rid of, and it sometimes drives me a bit crazy. Sew two button holes in the large circle, approximately opposite to each other, and approximately 2” from the outside of the circle. 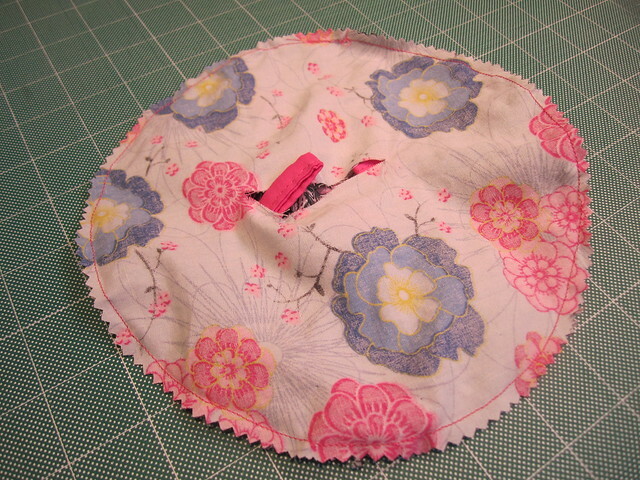 Sew the large circles together, wrong sides together. 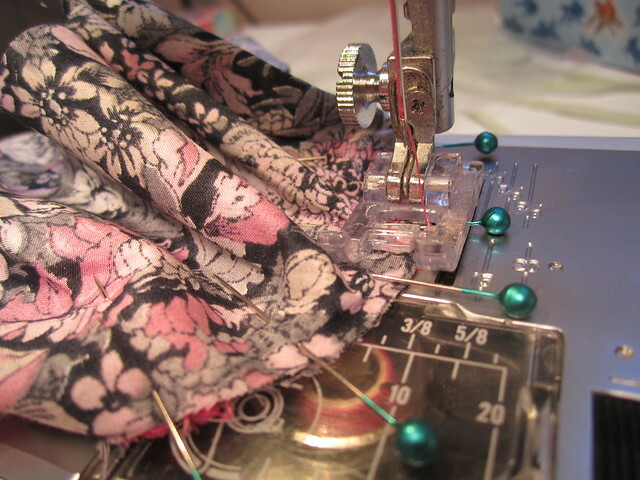 Slash a hole in the middle of the large circle that doesn’t have the button holes, and turn it right side out. For a bit of extra security, I used a fusible interfacing to ensure the slashes don’t rip, but seeing as I sewed around this slash, it’s a step that can probably be skipped. Repeat this step with the medium circle and the small circle with doughnut piece, making sure to slash the medium circle not the small/doughnut combo! 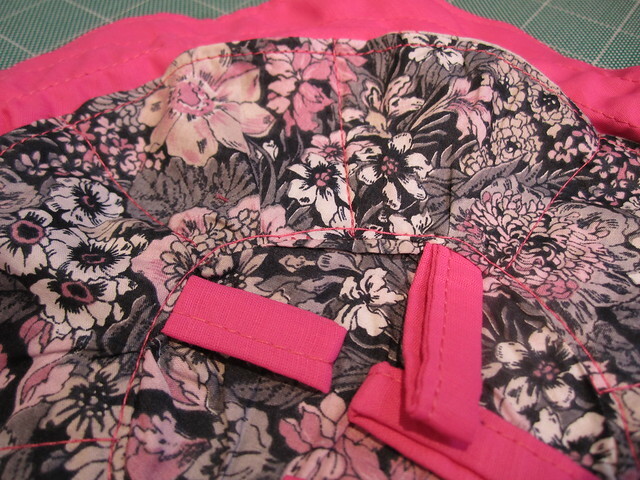 Sew around the large circles at the top and bottom of the button holes to create a pocket for the ribbon. Centre the medium circle in the large circle and sew along the small circle seam to connect the two pieces. 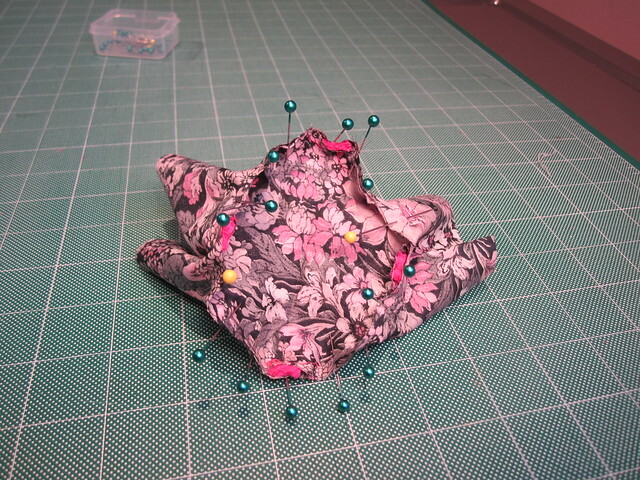 Mark approximate locations for pockets with pins, and sew along these lines from the small circle to the edge of the medium circle. I have 8 (approximately) evenly spaced pockets at (approximately) N, NE, E, SE, S, SW, W, and NW. 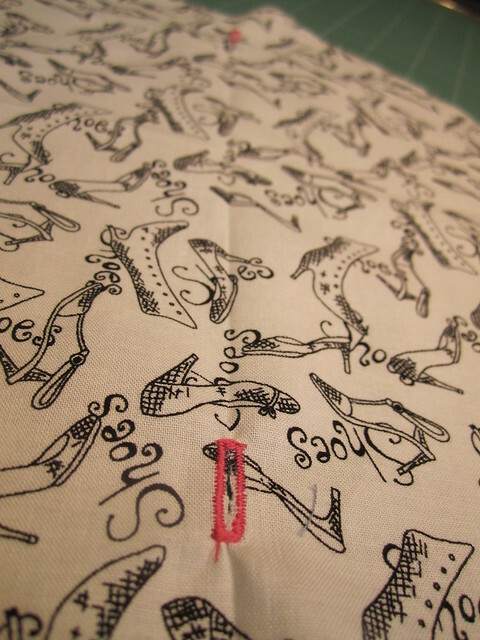 That’s one of the things I love about sewing this type of thing: approximate is a-okay! 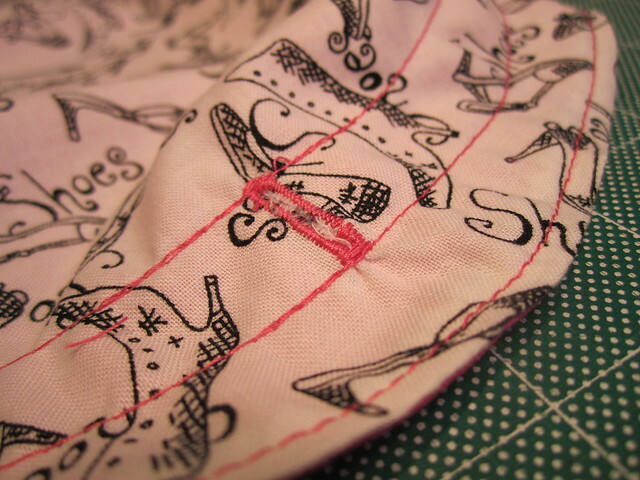 Thread two ribbons through, with the ends starting and ending on opposite sides of the circle. Pull these to close. I like to wrap the ends around the top for a bit of extra security.